Seventy years ago, the world was recovering from WWII. The Polaroid camera was first demonstrated, a UFO crashed in Roswell, New Mexico, and the sound barrier was broken by Chuck Yeager. Here in Holmes County, a group of concerned landowners and ag leaders banded together to organize the Holmes Soil & Water Conservation District (SWCD) on July 25, 1947. Now, all 88 counties in Ohio have an SWCD, and there are almost 3,000 districts across the U.S. The Dust Bowl brought devastation across the county, not only from the resulting dust "black outs" but also from the loss of topsoil and the resulting impact on crop & food production. Formed in response to the Dust Bowls of the 1930s as a local complement the federal Soil Conservation Service, SWCDs are arguably one of the most unique government agencies out there. Our funding starts with the support of our local county commissioners. The county appropriations are “matched” by the Ohio General Assembly through the Ohio Department of Agriculture at about 75%, to form our operating budget. The “match” ensures districts are working on local and statewide natural resource concerns. We are governed by a publicly elected board of five supervisors--landowners who serve on a voluntary basis--to prioritize our programs and provide financial oversight. Many people ask me, “So, what does SWCD do?” Our priorities are promoting conservation practices that improve water quality and increase soil health. We work with landowners to plan and design these practices, or provide information to them. We are the boots on the ground--stomping through the weeds and other, um, stuff--to survey and lay out practices like manure storages, waterways, underground outlets, cattle travel lanes, heavy use pads, and milk house waste storages, and stream bank fencing. Because water always runs downhill (that hasn’t changed in 70 years), we want to keep it from washing livestock manure and soil into the nearest ditch or stream. We work with our USDA Natural Resources Conservation Service partners to design and plan practices to their rigorous standards and specifications. Planning is another big part of what we do, to provide good information to farmers to manage nutrients (manure and fertilizer) so it doesn’t run off into the stream (you see a theme here). 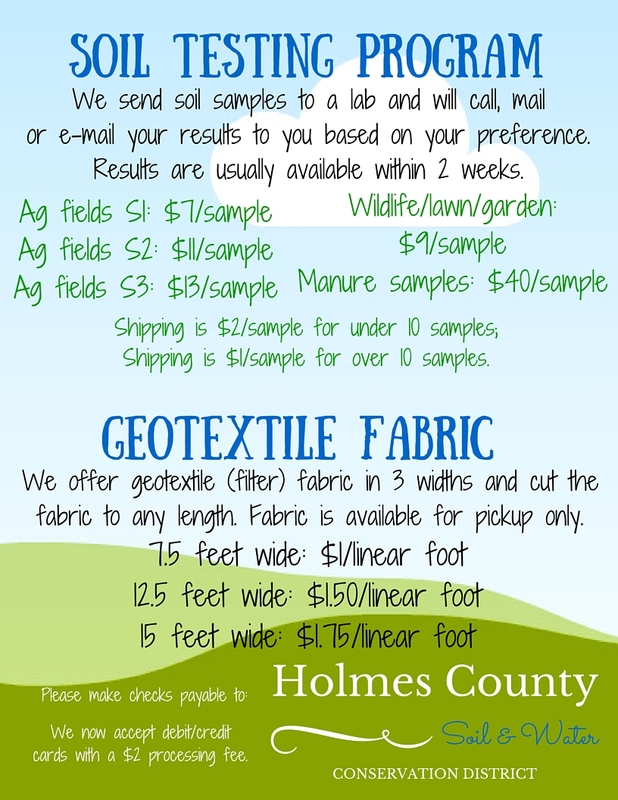 Our office is a pass through to a soil testing lab, and we can explain the results so that landowners understand what nutrients are needed, or not needed. And healthy soil, the unsung hero of natural resources, is needed to produce food, provide suitable foundation for infrastructure, filter water—basically sustain life. Franklin Delano Roosevelt pretty well summed it up when he said, “The nation that destroys its soil, destroys itself.” If you don’t believe him, do a quick google search about soil erosion in Haiti as a modern-day example. We also provide in-classroom presentations, and just wrapped up our 50th Tom Graham 5th Grade Conservation Farm Tour, where all the fifth graders in the county learned more about conservation and farming at Spring Walk Farm near Nashville. In addition, our staff organizes an extensive aerial cover crop seeding program, investigates livestock pollution, reviews Timber Harvest Plans, assists with milkweed pod collection for Monarchs, offers a tree seedling sale, hosts an Ag Appreciation Breakfast, among several other programs. 5th graders from East Holmes learn about the importance of water quality at the 2017 Tom Graham 5th Grade Conservation Farm Tour at Spring Walk Farm near Nashville. And while the world has changed dramatically in the past 70 years, there are a few constants, such as the importance of soil and water conservation. If you are interested in learning more about your local SWCD, join us Tuesday, November 14 for our 70th Annual Meeting at the Carlisle Inn in Walnut Creek. Our supervisor election polls open at 6:00 p.m., with dinner served at 7:00 p.m. The Carlisle Inn always serves an excellent family-style meal (with BBQ ribs and assorted desserts!) and the cost is only $12 for adults, and $4 for kids ages 3-11. After dinner, we have a short meeting honoring our 5th grade tour essay contest and poster contest winners, a Conservation Farm Award, Friend of Conservation Award, as well as a year in review video. Tickets can be purchased until November 3 by calling our office at 330-674-SWCD, ext. 3. Find out more at HolmesSWCD.com or see us on Facebook. Newer PostWhat is a Paw Paw?